A 20 anni dalla scomparsa di Aldo Rossi, il Politecnico di Milano organizza la Mostra ALDO ROSSI. IL GRAN TEATRO DELL’ARCHITETTURA con l’obiettivo di ricordare una fondamentale figura della cultura architettonica contemporanea italiana e internazionale che ha studiato e insegnato alla Facoltà di Architettura dell’Ateneo. 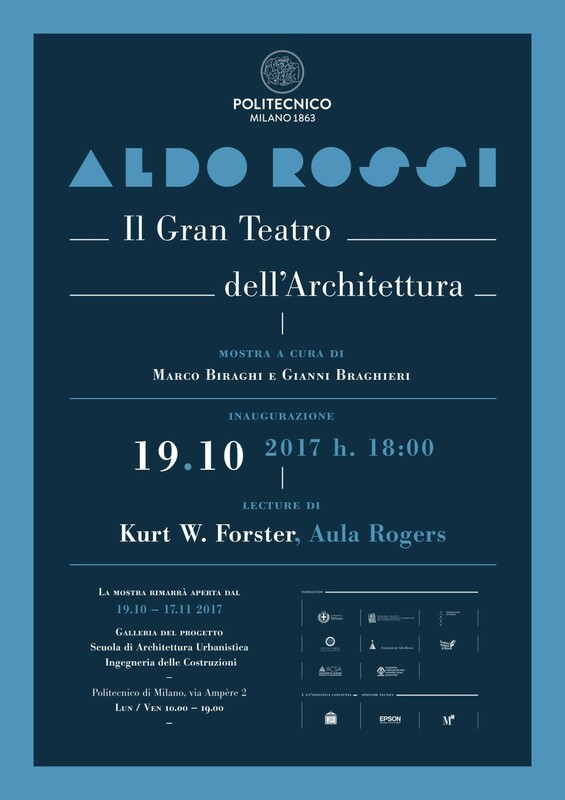 In occasione dell’inaugurazione della Mostra, il 19 ottobre 2017 alle ore 18,00, Il professor Kurt W. Forster, professore emerito dell’Università di Yale, terrà nella sede della Scuola AUIC una lezione sulla figura di Aldo Rossi e sull’eredità del suo insegnamento. 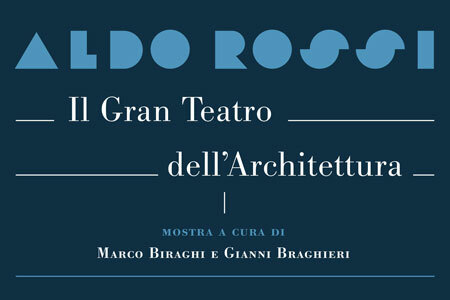 Posted in articles, news and tagged aldo rossi, gianni braghieri, Kurt W. Forster, marco biraghi. Bookmark the permalink. I just want to tell you that I am very new to blogging and certainly liked you’re web page. Almost certainly I’m planning to bookmark your blog . You really have amazing stories. Thanks a bunch for sharing with us your blog site. Sorry for the massive critique, yet I’m really loving the fresh new Zune, and hope this, as nicely as the Good critiques some other people today contain prepared, will assist your self come to a decision if it truly is the right preference for your self. I will right away take hold of your rss feed as I can’t in finding your email subscription hyperlink or newsletter service. Do you’ve any? Please let me recognize in order that I may subscribe. Thanks. What i don’t understood is if truth be told how you’re no longer actually much more smartly-preferred than you may be right now. You’re so intelligent. You already know thus significantly in terms of this subject, produced me in my opinion consider it from a lot of numerous angles. Its like men and women aren’t involved unless it is something to do with Girl gaga! Your personal stuffs nice. At all times care for it up! I’m just writing to let you be aware of of the remarkable discovery my cousin’s daughter obtained going through the blog. She came to understand lots of pieces, which included what it is like to possess a marvelous helping style to have a number of people with no trouble know just exactly specified tricky subject areas. You truly surpassed readers’ desires. Thanks for providing such productive, healthy, educational and in addition fun tips about your topic to Sandra. Hello there, I discovered your web site by the use of Google even as searching for a similar matter, your web site got here up, it appears great. I’ve bookmarked it in my google bookmarks. The Zune concentrates upon remaining a Portable Media Player. Not a internet browser. Not a recreation machine. Probably inside of the foreseeable future it will do even greater within those areas, nonetheless for already it is a superior course in the direction of arrange and hear towards your tunes and flicks, and is with no peer within that respect. The iPod’s positive aspects are its net browsing and applications. If those solid excess powerful, possibly it is your least complicated preference. Hello very cool blog!! Man .. Beautiful .. Wonderful .. I’ll bookmark your site and take the feeds also¡KI’m happy to find numerous helpful info right here within the publish, we want work out extra strategies in this regard, thank you for sharing. . . . . .